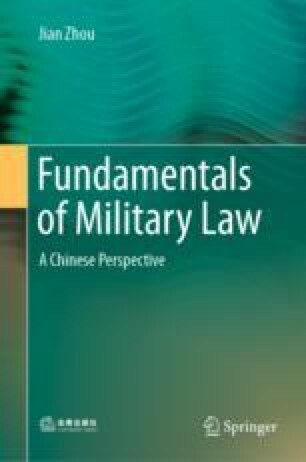 The Law of War is the legal regime of a series of principles, rules and regulations with binding force which regulate the relations among belligerent parties, among the belligerent parties and neutral parties or non-belligerent parties, and the combat activities during wars or armed conflicts in the form of treaties and custom (GU Dexin. An Introduction to the Law of War, the National Defence University Press, p.9, 1991)The Law of War mainly includes two parts: the first part is the principles, rules, regulations and regimes which regulate the relations among belligerent parties, among the belligerent parties and neutral states, and stipulates the beginning and the end of war; the second part is the rules and regulations regulate the activities of the belligerent parties. The second part can be further divided into two sections: one is the rules and regulations which restrict the means and methods of operations, which is represented by the Hague Conventions; another one is the principles, rules, regulations and regimes which protect civilians and war victims, which are mainly contained in the Geneva Conventions.